Seven Mile Weddings Lennox Head is the premier beachfront wedding reception venue nestled near Byron Bay to the north and Yamba to the south. Specializing in beach-themed weddings and receptions we look straight over Seven Mile beach Lennox Head from this stunningly designed venue. The versatility of the venue is shown through the ability to look natural amd relaxed or if preferred extremely sophisticated. Industrial framed solid timber top tables, two feature copper waterfalls, natural timbers, Moroccan patterned tiles, exposed brick, white shiplap panelling and copper pendants gives the feel of an industrial beach setting with a touch of southern Europe thrown in. Exclusively designed with private kitchen, bar, exquisite private amenities, natural tone furnishings, state of the art Audio & P.A. system these features and more are all inclusive with your venue hire. 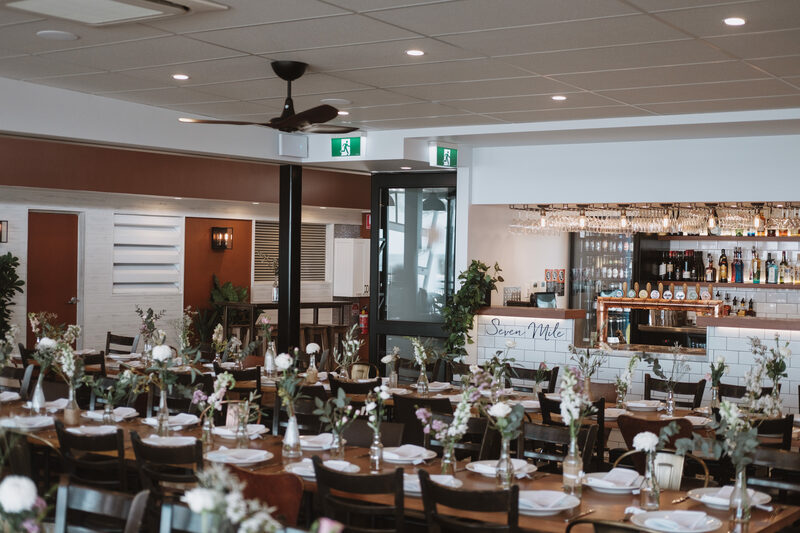 The catering for all Seven Mile Weddings is provided by the beef+beach Lennox Head (beefandbeach.com.au) who prides itself on high quality Australian meats and fresh local seafood. Seven Mile Weddings service staff are highly trained, caring and ready to deliver a professional standard for your reception. Seven Mile Weddings is very pleased to align ourselves with our preferred partners. ranging from wedding hair and make up specialists, very popular celebrants, the best photographers & wedding stylists, impressive wedding cake designers, luxury hire cars, lighting and music specialists, multiple local accommodation options & amazingly talented florists we are confident these professionals are sure to impress.